A promotional shot for Bluey. 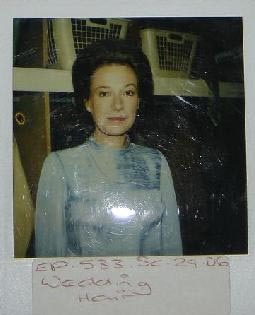 When shooting the famous wedding scenes in episode 533 of Prisoner, this Polaroid was taken of Gerda behind the scenes, all dressed up. 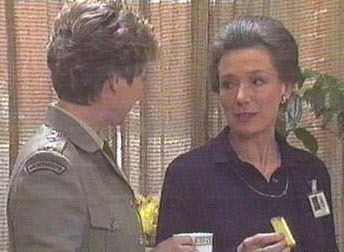 In this scene together with Elspeth Ballyntine (Meg Morris) in Prisoner's episode 678, Gerda's hair gets entangeled in the plant behind her as she speaks, and as she moves her head, the plant moves along with it. 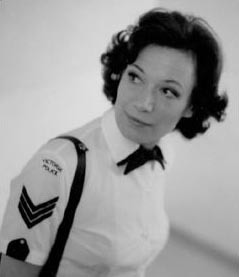 Nevertheless, she continues to act in order to finish the scene. The Prisoner cast in 1983 includes many of the great and well-remembered characters. 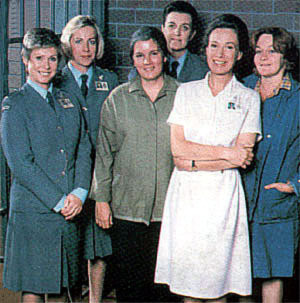 From left to right are: Elspeth Ballyntine (Meg Morris), Judith McGrath (Colleen Powell), Betty Bobbitt (Judy Bryant), Maggie Kirkpatrick (Joan Ferguson), Gerda Nicolson (Ann Reynolds) and Val Lehman (Bea Smith). 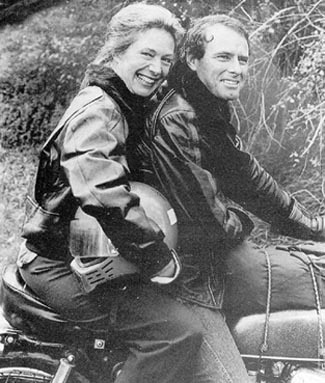 During the shooting of Prisoner's episode 602, this photo was taken of Gerda together with Sean Scully on the back of Sean's character's (Dan Moulton) motorcycle. Ann Reynolds' daughter Pippa is married. During the filming of the episode, a bikie-gang was to ruin the wedding for Pippa and her guests. The bikies we saw were actually real bikies, hired for the episode. 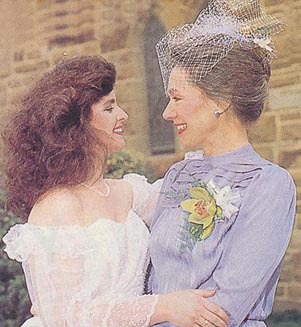 This photo between scenes was taken and published by the press (TV Week) on November 2, 1985.